This is a recipe that my German mother-in-law always made at Christmas. I have no idea where it got the name of “Russian Tea Cakes” but is absolutely my favorite cookie – a rich dough formed into a pinwheel with raspberry jelly, nuts and cinnamon on the inside. Use parchment paper on the cookie sheets and it will make it much easier to remove cookies from the pans. After 50+ years of baking cookies I finally learned to use parchment paper and it has been wonderful – why did I not start using it years ago rather than trying to scrap sticky cookies off the cookie sheets? 1. Beat butter until softened. Add sugar and beat until light and fluffy. Add egg yolks, sour cream and vanilla and mix well. 2. Sift together flour, baking powder. Add to egg mixture and beat well. Remove dough from bowl and wrap in plastic wrap. Refrigerate overnight. 3. Divide dough into 3 equal parts. Roll out on a floured surface into a long rectangle about 1/4 inch thick. Mix together sugar, cinnamon and nuts and sprinkle on dough. Pour warmed jelly over sugar, cinnamon begin careful not to pour it too close to the edge. 4. Roll up the strips as you would a jelly roll. brush dough with egg white. Place rolls of dough on a cookie sheet and refrigerate until firm (or place in the freezer for about 20 minutes) – this makes it easier to cut into slices. 5. Cut the rolls into slices. Place on a parchment paper lined cookie sheet (The parchment paper will make your life much easier and the cookies are a breeze to remove from the cookie sheets). 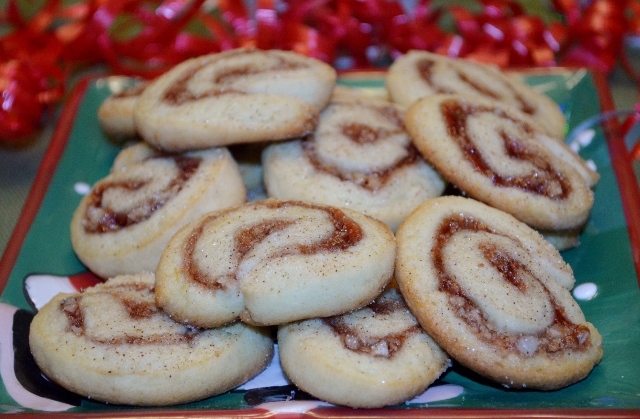 Sprinkle the cut cookies lightly with some extra cinnamon/sugar mixture, if desired. 6. Bake in a preheated 350 degree oven 12 – 15 minutes or until delicately brown. Cook on rack. Makes 2-3 dozen. Store in a tightly covered container. Thanks a lot. I love them!